Apple's iTunes Store sports a bold new look with Wednesday's release of iTunes 9. 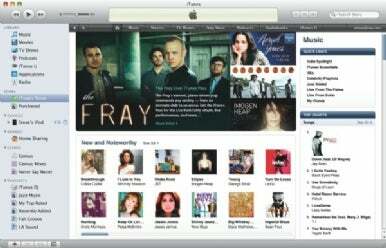 Apple emphasizes the new release's navigational improvements and a richer media experience for iTunes users. The iTunes Store gets a fresh look and new content -- iTunes LP and iTunes Extra. iTunes LP provides music listeners with an expanded media experience similar to buying an LP record, with the music featured along side album art and photography, liner notes and other material. So far the iTunes LP material is only available for a limited number of artists, including headliners like Dave Matthews Band and Norah Jones, who performed a couple of songs on stage with Steve Jobs on Wednesday. Apple says it's offering the artists and labels the tools to build their own iTunes LP content. iTunes Extras serve as the equivalent of iTunes LP for video content. The equivalent of the "Special Features" section of a DVD or Blu-ray Disc, iTunes Extras include documentaries, deleted scene footage, interviews, and interactive galleries. Select movies like "Twilight," "Batman Begins," and "WALL-E" already have iTunes Extras content available through the iTunes Store. The iTunes Store features improved navigational elements, including a redesigned horizontal navigational bar with hierarchical menus enabling users to quickly navigate to specific content types—music, movie, and TV genres, App Store categories, podcast, audiobook, and iTunes U educational material. Apple's refusal to offer Blu-ray Disc drives as an entertainment media option has disquieted some critics who see the company falling behind other PC makers who offer the option. But with iTunes LP, Apple's long-term strategy is underscored: The company continues to see the future of entertainment in downloadable content, not in content fixed to a media disc.